Hello all, another quick share. This card is based on space theme. I sponged different shades of blue ink on water color paper and then sprinkled some water to get the background. Then I used a gold water color and added more splatters. The scale is from Create a Smile, I stamped in grey ink and colored using sparkly silver markers to give a shiny metal look. I also stamped the word 'LOVE' and some currency on the scale, but decided to leave it outlined with no color. The sentiment is stamped in grey ink, and is also from the same set above. Finished off the card with few tiny gold jewels, and framed the water-colored panel with a gold card stock. I used the stamps from Create a Smile for this card. Sponging is my all time favourite technique. Oh, this one packs a punch - love that sentiment and the image to go with it - what a match! The galaxy background is great! 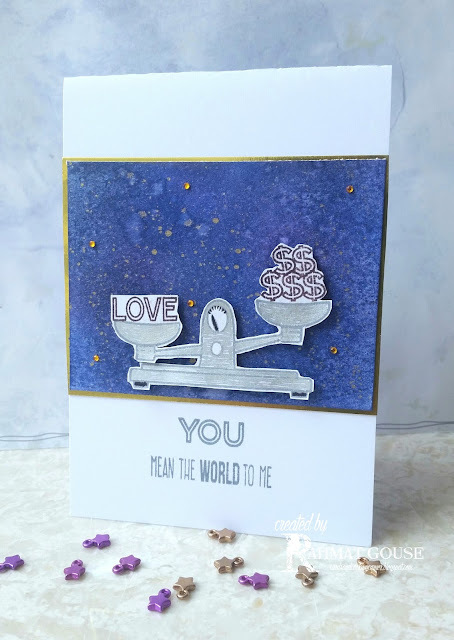 A fabulous card for our Challenge at Stamping Sensations! Thanks for joining us this month and good luck!